HP Umpire Greg Howard ejected Melbourne Aces DH Luke Hughes (strike three call) in the bottom of the 5th inning of the Geelong-Korea vs Aces game. With none out and the bases loaded, Hughes took a 2-2 pitch from Korea pitcher Byeong-Geun Kim for a called third strike. Replays indicate the pitch was located near the inner edge of home plate, an uncaught third strike (no PFX/TrackMan). At the time of the ejection, the Aces were leading, 3-1. The Aces ultimately won the contest, 11-1. This is Hughes' second ejection in as many days; umpire Stewart Howe ejected him on Saturday. 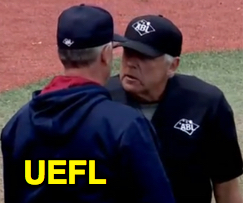 Related Post: ABL Ejection - Stewart Howe (Luke Hughes) (12/1/18).